In English, passion can mean intense emotion, or it can refer to the death of Our Lord Jesus Christ. On this day it means both. This is not a silly lover mooning after his beloved but rather the lover who does “not cry out, not shout, not make his voice heard in the street,” who will be silent before Pilate. “A bruised reed he shall not break.” And who among us is not a bruised reed? The cross quickly became the image of Christ for early Christians. Crosses were drawn on walls and secretly worn around necks, but it took hundreds of years before the body of Jesus was presented upon the cross. The memory of His passion was simply too great. 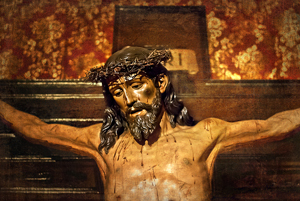 Today let us take into ourselves the passion of Jesus and dare to join our image with His on that cross. Rev. J. Francis Jones, C.Ss.R.